--From the Gameboy Mega Man 5 instruction manual. are the Stardroids that Dr. Wily has collected from outer space, which are far superior to his past robots. and the controls are very responsive. 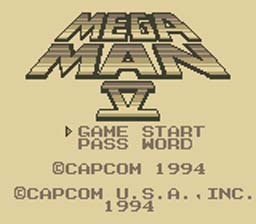 This is a must play for any Mega Man fan, and the final Mega Man in the GB series. So break loose and give Mega Man 5 a try. Beat all the Stardroids, and then face off with Dr. Wily. than the Mega Buster, but has its own set of drawbacks. In Mega Man 5 you can collect P-Chips that can later on be exchanged for power-ups. The P-Chips are fairly easy to obtain; just like in Mega Man 4 they can be picked up off of dead enemies. Possess all Items and Power-ups.